After the proven success of the first Royal Lady limited edition fashion watch, Edox is introducing a new version of this magnificent feminine timepiece. The new Heartbreaker Love Edition is an ode to love and romanticism. This latest little addition to the Royal Lady Collection is a sweet tribute to lovers. Adorned with 68 diamonds, the steel case has changed slightly from the earlier Royal Lady fashion watch, becoming rounder and more sensual. 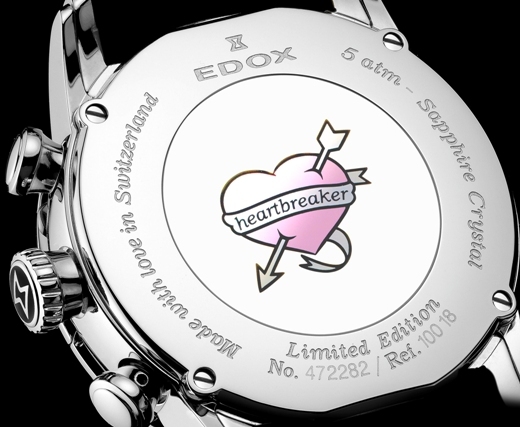 However, the real attraction is in the small Heartbreaker details: the silver-plated dial proudly displays Heartbreaker Love Edition at 6 o’clock in bright pink while the transparent case back is engraved with a colored heart pierced with an arrow, in the slightly kitsch tattoo style. 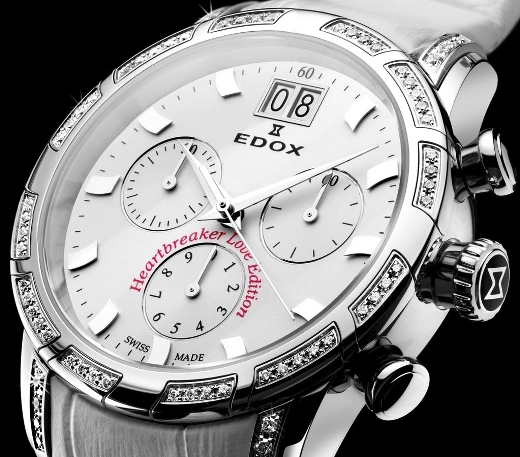 The Heartbreaker is comfortable to wear due to its ideal 36 mm diameter. The Heartbreaker watch has a white crocodile-skin strap with a steel folding clasp that completes the combined image of elegance and sportiness. The Heartbreaker Love Edition, with its quartz chronograph movement, is limited to 200 pieces and, as a final feminine touch, is presented in a magnificent pink heart-shaped box.